This boulder is up on Poles Hill, one of a number scattered about on the bald, rocky hilltop. 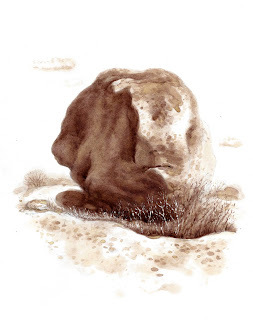 It’s said that Native Americans used this barren hill and these peculiar, isolated boulders, close to shore of the Annisquam River, as an observatory of the sky and seasons. Day is probably my earliest immigrant ancestor, and he faced a lot of hardships, I’m sure. I can’t imagine how he survived the weather. On the day of my drawing the sun was bright, but the wind off the Atlantic was fierce. I had originally hoped to draw by the shore but that was impossible. Sitting on Pole's Hill however, I couldn't help but think that the arrival of my ancestor and his fellow “settlers" closed this observatory of the original settlers down and drove away what the old book called the “savages.” Sadly, we stepped into the story of America by kicking the natives aside.